It has a bit of blue in the tummy! Maybe it’s a reincarnation of a smurf, now 3 strawberries tall instead of apples. I was told that this pen is a vintage. And then I was also told that vintage is subjective. This #31 was probably manufactured during the 1960s, so does that qualify as a vintage pen? To me I think vintage stuff are stuff that were from 2 generations ago – that would be about 50 years ago. So I guess by my definition, this is almost vintage, I guess? It is clearly an old and used pen, judging from some marks on the pen barrel probably caused by posting the cap. And post it you should – unless you love writing with tiny pens. This Mont Blanc 31 measures about 12.8 cm capped and 13.7 cm posted. Both dimensions could be measured on my 15-cm ruler! I don’t remember using a fountain pen that I didn’t measure with a longer ruler before. There is also some tarnishing of the gold trimmings, and virtually all the gold plating on the nib was gone. Unless they have turned into white gold – not very likely, I guess? Could I harvest some of it and try to sell them to recuperate my stationery fund? In addition to being small, it is also lightweight. Do you prefer heavy or light pens? I love heavy pens because the weight of the pen makes me feel a little more confident in writing. But it also means I would grip the pen tighter and put more pressure on the paper if I write with heavy pens. Using this Mont Blanc 31, I somehow felt a little bothered by the lack of anchor due to its light weight, and this made me write ultra-carefully, barely touching the paper, and feeling like the pen would slide out of my fingers anytime. Not the perfect writing experience. Or should I precise: I find holding this small pen a pleasure but it is definitely not for writing 100-paged philosophical theses with. Imagine cracking your heads and brains for your bombastic analogies, and having to consciously cope with your pen experience? Not such a nice picture. I’m sure it was a smurf. Look at the remains of their white caps. On the other end it’s white too, probably their shoes! Another paragraph about the weight of the pen. Sorry, I can’t stop ranting about it. 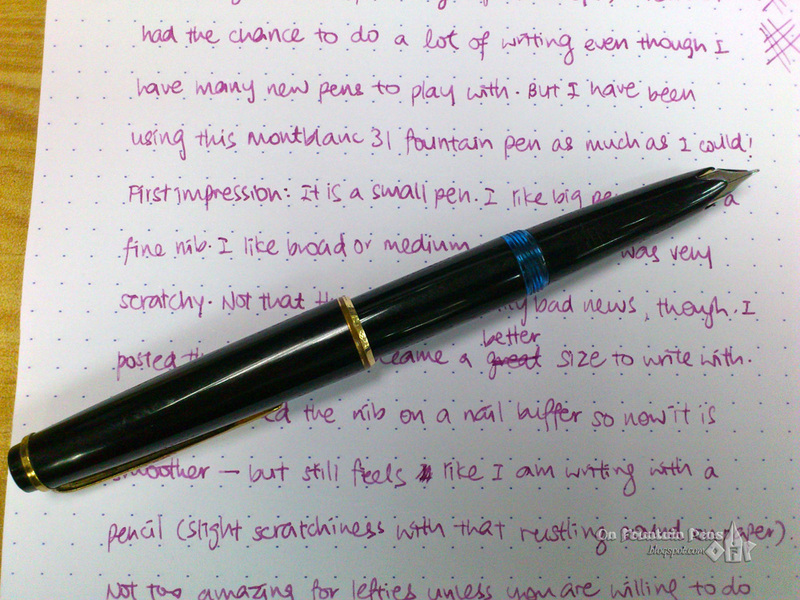 I have a Pilot 78G which is very light, but it is nice to write with. 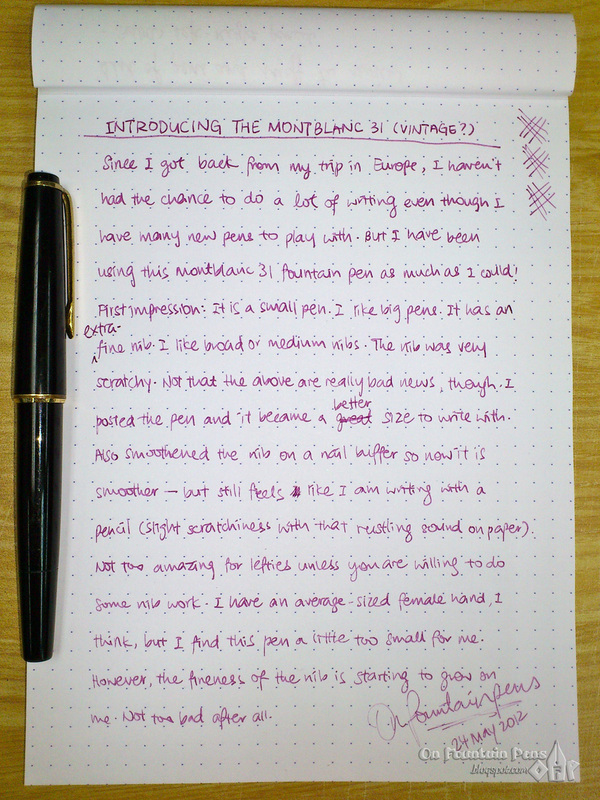 While writing with the Mont Blanc, I was constantly reminded of the Pilot, probably due to the similarity in weight, and perhaps the shape too. The Pilot is probably slightly fatter, and this makes a world of difference already. Mont Blanc 31, please put on some weight! I like fat pens! Let’s now talk about the nib. 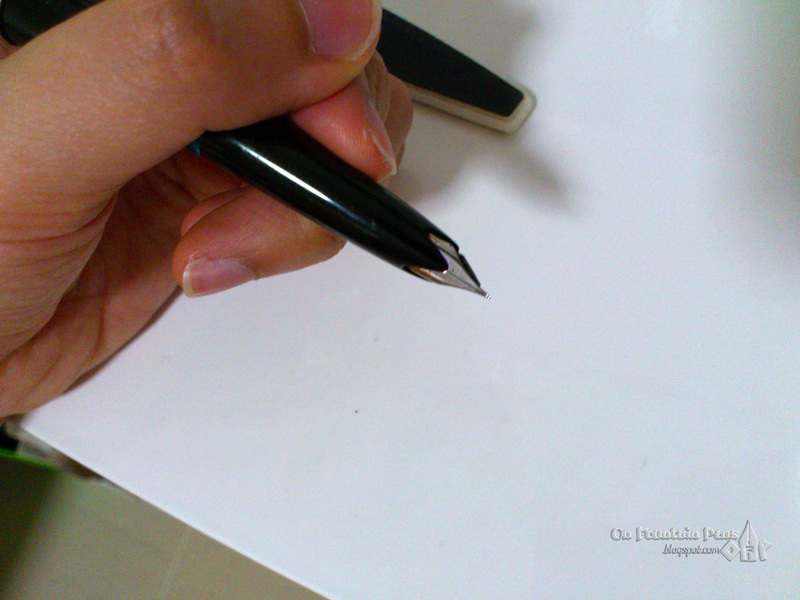 The 31 that I have is equipped with an extra-fine nib. My very first EF! When I first examined the pen, I found out that from the side view the nib has a slight how-do-you-call diagonal shape to it, as if it had been chipped off there, or it had become flat due to too much writing. I asked the seller if it had been ground before. Negative. I tried writing on copier paper. Incredibly scratchy. Then I tried writing on my beloved Rhodia Dotpad. Better, but still a no-go. I blame it on two things: the first being that things and people which are “extra fine” or who think they are “extra fine” seem to tend to be very picky, so perhaps my MB31 is picky about my writing angle. Secondly, the fact that I am a leftie already disqualifies many eligible bachelor-pens, as most fountain pens that I write with will grumble when I push them across the paper. Especially finer nibs. So it seems that this EF and my left hand are not the best match after all. Not to fret, though. I have a secret weapon to curb my scratchy enemy-nibs. My nail buffer! Probably not the best idea, but for a novice like me, anything that works, goes. So I drew a few lines and circles on the rough part of the buffer, and it was greatly improved. It still doesn’t write silky-smoothly, but we can’t expect too much from a bad nib-hand combination, and I already like it much better now! A nice aspect of the Mont Blanc 31 is the way the nib section is designed. It’s called a wing nib, I think. There is another interesting design I saw on the internet on other Mont Blancs called the intarsia nib, which I’m really curious about! I love interesting nibs. They can be a whole art in itself. The wing nib, ready to fly across the page. Oh and have I mentioned, this pen is a piston-filler. I love piston-fillers. My TWSBI 530 and Noodler’s Ahab are some examples of nice pens with piston-filling mechanism. And now a Mont Blanc with a piston-filler, too! I was really happy about it. It was a little stiff to twist the knob to raise and lower the piston, but I think if I dismantle the pen someday and apply a bit of grease, it would work great. As with all screw-capped pens, I would comment about the importance of not having too many threads for screwing and unscrewing the pen cap. Mont Blanc 31’s screw cap is just about perfect. It requires not even one revolution to uncap the pen – in fact, It was something like 5/6 of a revolution. So, when you want to jot down a note immediately, just twist in a single action and it’s ready to go! Mont Blanc has expressed on Twitter that they hope my hands will be the last owner of this pen (poor pen, being transferred between so many people), and I think they won’t have to worry! This pen may not be perfect, but I think it’s a keeper. It has enough interesting points for me to like it, and anyway, my issue with the scratchiness has been more or less resolved, so I can use it to write a decent amount of notes without feeling bad about it. 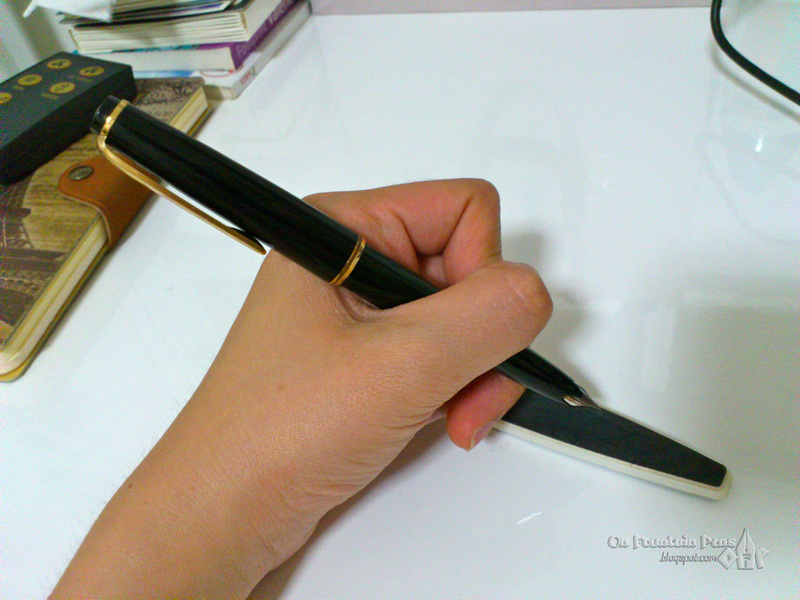 <img class=" size-full wp-image-2031 aligncenter"
That is a nice pen for a first fountain pen! The nib I have is actually not flexible, unfortunately. Thanks for visiting my blog, glad you enjoyed it! I know some people think that Montblancs are not worth the price, but I do love the look and feel of a good Montblanc. I hope you enjoy yours! Hello! Yea, I wish I could say that price is not everything, but I am on a self-imposed strict stationery budget, so it means that price is a very important for me. If I spend too much in one month it means I can buy less in the next month. That's why you don't see any high-end pens here (in terms of price), because it might potentially mean many months lacking new pens! 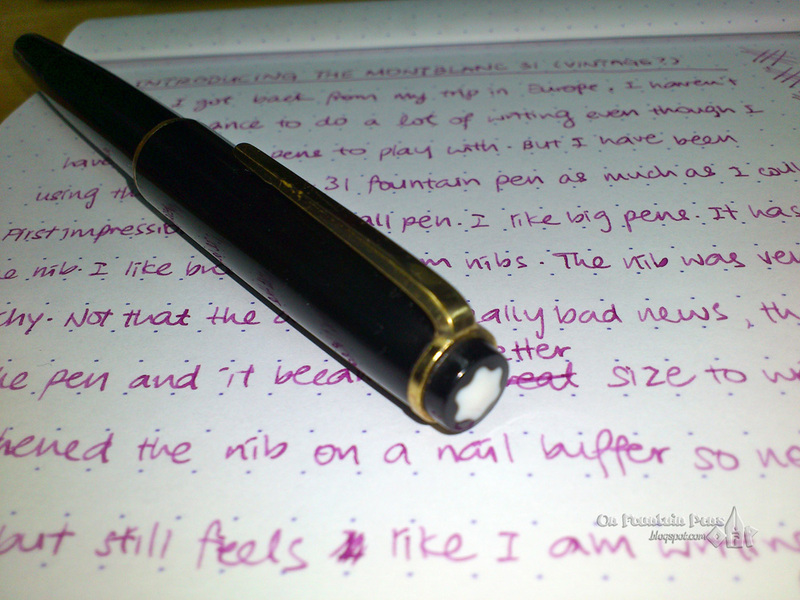 But I am indeed enjoying the experience with different fountain pens, that is without a doubt. 🙂 But you are right, though. An old pen like this probably holds many nice memories and went through a lot. Older than me! Don't fret too much about the price. When it comes to vintage (whatever you wanna call 'em), condition is *everything*. It's not like you can take the pen back to a shop to exchange for another one – no-one makes them any more. Any cracks? Piston working? Nib OK? Is the dealer reputable? After a while you'll find these are more important to you than trying to save a few tens of dollars.